New Flyer Industries, a manufacturer of heavy-duty buses, has announced that it has been approved for a $2.1 million grant from the California Energy Commission. The grant will help fund a demonstration project that involves the company’s Xcelsior transit bus, which will be powered by a hydrogen fuel cell developed by Hydrogenics. The project may draw more favorable attention to fuel cells and how they can be used in the public transportation space. The project is meant to further encourage the demonstration of advanced clean technologies. It is also meant to help facilitate the development of commercial vehicles that produce no harmful emissions. Such vehicles could reduce the demand for conventional fuel, as they will require hydrogen to operate or otherwise use batteries. The project may also highlight the economic benefits of fuel cells and clean transportation in general, which may help make clean vehicles and fuel cells more attractive. The New Flyer hydrogen bus will be using an electric drive motor developed by Siemens. The bus will be supplied with the electricity it needs to operate by a fuel cell system. The system will consume hydrogen in order to generate power and this process will not produce any harmful emissions. According to New Flyer, its fuel cell bus can displace some 115 metric tons of carbon dioxide every year, making it one of the most environmentally friendly public transit vehicles in the world. Because the bus is equipped with fuel cells, it will be able to operate for much longer periods of time compared to conventional vehicles or those powered by battery systems. Fuel cell vehicles can be fueled in a matter of minutes, whereas battery electrics take several hours to fully charge. 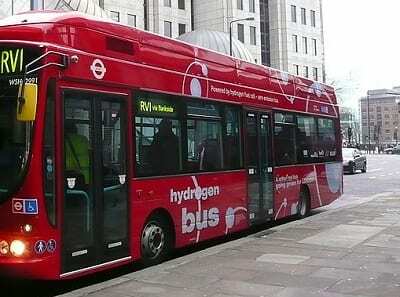 The durability of fuel cells also provides them with a long lifespan, which is ideal for public transportation purposes.